What’s up everybody? Fred Lam here and welcome to our daily huddle episode number 34. We are officially back from the holidays. I hope that you guys had your family time and most importantly did whatever you wanted for the last four days. I know that at the end of the day those are the only four days that I would actually tell you to, “You know what stop working, spend time with your family. Enjoy the Christmas.” At the same time we are entering into the New Year. We are only a couple of days or less than a week to get into the New Year of 2018. I’m here to help you guys and do everything that I can in order for you to be successful in 2018. Here’s a very awesome news for every single one of you at the same time. Yesterday was Boxing Day and it was technically the last day when it comes to Q4 of Ad spend. Once the 26th ends on the 27th usually ads basically with inventory being more available and CPM starts to drop. I had a quick conversation with couple of my friends who are advertising a lot on Facebook and they have seen a 50% reduction on their ad spend right now. I mean CPM, cost per thousand views right off of Facebook. And at the same time, I actually looked in to my account, I’ve seen a 30% decrease in my CPM and my conversion jumped right back jump. So, right now it is definitely the best opportunity for you. You don’t have to wait for Black Friday or Boxing Day or Christmas or holidays to actually make your sale. You have to create your business where it is sustainable and everyday even though it is not a holiday or people are not in the “spending mood” you can still actually profit from all these people. There’s a question that got brought up to me, “Fred, can arbitraging inventory makes millions a year?” And the answer to that question is YES. I’ll drill it down a little bit further so that you guys can prepare your mindset for 2018 and actually set a higher goal. You need to set a goal that you feel uncomfortable because in order for you to get a breakthrough in both your life and your business, you have to be uncomfortable on whatever you are doing. If you are comfortable right now I will tell you, you are not going to succeed. You have to get yourself super uncomfortable because when you feel uncomfortable you will find ways to survive and find ways to be hungrier and to succeed online. We’re starting to have a lot of people joining us right now. In the comment box on Facebook and on YouTube, use couple of words to describe how your Christmas was, just out of curiosity. While those are coming since I did not do our daily huddle last Monday and Tuesday because of the holidays so today I’m going to announce our winner to our Kickstart 500 grant where I’m going to invest $500 to you and your business. If you’re starting out a business, guess what? Invest that money wisely and Kickstart 2018 right out of the gate. I have Leo on YouTube asking me of my goals in 2018. I’m still going to do our daily huddle until Friday so that day I’m going to share with you guys what my personal and business goals are in 2018. I want you to actually reflect and set a goal for yourself at the same time also because it’s very important for you to set goals. You have to set goals those are not like the sky is the limit. You want to set up like mini, mini goals and eventually hit a big milestone that will get you uncomfortable but at the same time can be a life-changing. I’ll share that on Friday during our daily huddle. [0:05:56] Question 1: What are the characteristics of a winning product? Let’s identify the characteristics of a proven product. The characteristic of a winning product or a proven product that works really drills down to the data that you are actually getting from your ads. Now we move to the super important part which you said that you are confused if it is the product problem or the ad problem. That’s a very legitimate confusion that you may have and that’s what a lot of people are trying to figure out and a lot of people are trying to break through in. This is why I created a video training that’s called the 3X3 Facebook Ad Method. And that actually is set up for you to figure out if it is the product problem or if it is the ad problem or most importantly if it is the audience problem. I don’t want to be a broken record about this. It is very important that you need to know that it’s not just the product and the ad; you need to know that the audience is also a targeting that will either make or break your campaign. Again, I’m not going to go into details about this because I talked about this many times during our daily huddle. What I would suggest you to do is go to my YouTube channel and search for Facebook 3X3 Facebook Ad Method. I have the entire training video and I created that specific strategy so people like you can figure out if you are encountering a product problem, an ad problem or a targeting problem. I explained exactly what that is all about inside that video so go ahead and watch it. It will clear up a lot of the confusions that you may have. [0:08:11] Question 2: What are the best country to target for shipping zone? What are the best country to target for shipping zone? cos I’ve seen many people in their website they only choose Canada, UK & US. but me, I selected all country which have epacket shipping system. I’m stuck here. Still thinking is it okay if select all country which have epacket or choose only Canada, UK & US. Great question! My answer to you is simply mark USA as the domestic area. Anyone who is actually from USA, they know that it is basically from US shipping zone. For the rest of the world, it doesn’t matter if it’s Canada, UK, Australia, and New Zealand; you set up a shipping zone just for the international customers to actually use that shipping zone. With that, you usually use the same shipping table as the US and also international regardless of where you are around the world because e-packet pricing is somewhat the same in all different countries. If e-packet is available for whatever country that you are selling into at the end of the day obviously the pricing is not going to fluctuate as much so you have to set that up. When it comes to ads, you have a legitimate question. Should you be going after USA, UK, Canada or basically select all the countries which have e-packet? What I normally do, I always test the US market first because the US market is obviously the most tech savvy, and people are buying a lot of stuff online. And yes that’s true that CPM is a little bit more expensive in the US market. At the same time, it doesn’t mean that Canada, UK, Australia or any other countries that you can ship with e-packet does not work. What it means is that you have to actually test it out yourself. I have a lot of members who have been testing from different countries which have e-packet and they are absolutely crushing it. But if you are able to break even with US targeting, chances are all these other places with e-packet will make it work at the same. Right out of the gate, test the market out to see how it works, get your feet wet but at the same time you are the person who runs the business. If you think that maybe in Saudi Arabia or maybe in Italy or France that is going to work well and has e-packet for you then go ahead and test it with $5 a day and let the data tell you if it is working or not. This should not be a stuck point for you. What it means is that it’s just that you now basically have done your homework. There are a lot of other countries which accept e-package for whatever product you are selling. Test it out with $5, you may be amazed that France accepts e-packet may do a lot better than US and Canada. I actually have a student who just focused primarily on France and he is absolutely crushing it at the same time. Again, you should not have this as something that is a stuck point. At the end of the day if you are unsure and that you have something inside you that says, “I think this may work.” Well guess what, test it with $5 budget and let the data tell you if that’s going to work or not. You are the person that is in your business. I am not in your business but I can give you advice. You know your business a lot more than I do, not given the fact that I don’t know what your domain is, I don’t know what your niches and I don’t know what your product is going to be. But if you feel that in France it has e-packet and it’s going to sell well in there, test it out and find out if it is really going to sell or not. If it’s not going to sell you may just waste $5 but at the end of the day you don’t have to guess anymore and you know what is working and what is not and that’s the most important thing. When it comes to running an online business, you have to be consistently testing different parts of your business because each test will let you gain more knowledge. You’ll know your market more and it will help you build your business and start pushing your business forward. That’s my recommendation to you. [0:13:04] Question 3: When choosing products from AliExpress, is it enough to just pick products that have a high order history? I’m thinking of selling pet accessories. When choosing products from AliExpress, is it enough to just pick products that have a high order history? For example, a dog collar that sold 5000 times on AliExpress? Here’s the answer to your question Alicia, even if the product sells a lot on Aliexpress it doesn’t mean that you can sell it. I want to show you an example. I was going through my Facebook news feed and I found this and I want to share this with you guys. I actually saved it because I’m going to make a case study out of it for my members’ area. This product over here, it’s a titanium ring. You may be wondering well it’s just a frigging titanium ring. It sells thousands on there. Well when I sell it, I can’t sell it but why would other people do really well? If you actually look further, this is crazy. It has 2.6K reactions, 253 shares and I would say this is doing really, really well because the Facebook page has 164 likes. Even if you can identify a product and even though it’s just a very generic product, it doesn’t mean that it’s going to work for you when it works for others. Again, like I said earlier there are three variables that will always affect your data; number one is the ad creative, number two, the product and number three is going to be the targeting. Now, let’s say that you did your due diligence. You found on Aliexpress the highest selling product, you may have seen some Facebook ads to it and you know that this product sells. That still drills down to two variables that are very important; number one is the ad creative itself and number two is the audience. You will never know what audience works and what audience doesn’t work until you start running ads and get the data yourself. What I’m trying to say is that at the end of the day it doesn’t always mean that when you go to Aliexpress and you see that there are 5,000 orders for that one particular product that maybe a product that’s going to work for you or not. There’s no guarantee. Now what I can tell you is that you have to test it out based on your creativity with the ad and the targeting. Those two are going to come back with data to tell you if that product is going to sell or not. As a matter of fact I would even actually deal on this like a secret. Some people and some of my members whom I know, they are selling products that are very rare on Aliexpress. There are not a lot of orders and it’s a very rare product, not a lot of vendors have it but they are absolutely crushing it. So ultimately it doesn’t matter if that product has a lot of orders or doesn’t have a lot of orders. What’s important is the quality of the product, if it’s really a high quality and number two if it is has a wild factor that you can introduce to the target audience who will most likely respond and that is the actual key. When it comes to advertising and building a business online, yes the product is important but you have to absolutely understand one thing, you need to know on the other side of the screen, what is that person really interested in and how can I actually get him to pull out his credit card? You have to start looking at the psychology side of things that’s why I keep saying, “You have to be in your niche.” You have to be passionate about what you are selling. Let me give you an example, this thingy over here. I just ordered this for the fun of it. This is a banana holder or whatever; I don’t even know the name of it. It looks like a frigging pink banana. I hate bananas and at the end of the day, can I sell this well? Not really because I’m not a banana lover. I don’t know why I would need this banana case. Why would I need a frigging banana case? But if you love bananas, you would know why you need a banana case. It maybe because you want to actually prolong the shelf life of your banana or you might want to protect your banana from germs so you don’t actually get sick. I don’t know, I’m just making it up right now. At the end of the day, if you know your market well enough you can actually create a message that resonates with that banana lover at the same time that will actually take action. And that is the actual key because if we look at ads right now, it is all based on psychology. It is based on behavior of that person. Like I said it can be a product that sells for thousands but if you are not able to find the pinpoint or you’re not able to identify the target audience who really wants that product, you are not going to succeed. I just really want to bring that up and let you guys know. Also, a lot of people say “I’ve seen a Facebook ad that has done over 10k reactions and a lot of shares but I can’t get that product to work.” It’s not that the product is not selling; it’s just that your creative and targeting may not be right. You need to actually test it and be in the shoes of your customers. That is very, very important. [0:19:22] Question 4: Will arbitrage alone reaps profits of millions in the e-commerce field? Or arbitrage is just a stepping stone to a greater milestone in e-commerce such as having own products and drop shipping to reach millions in profits? Hi Fred, will arbitrage alone reaps profits of millions in the e-commerce field? Or arbitrage is just a stepping stone to a greater milestone in e-commerce such as having own products and drop shipping to reach millions in profits? That’s a really great question that you brought up. 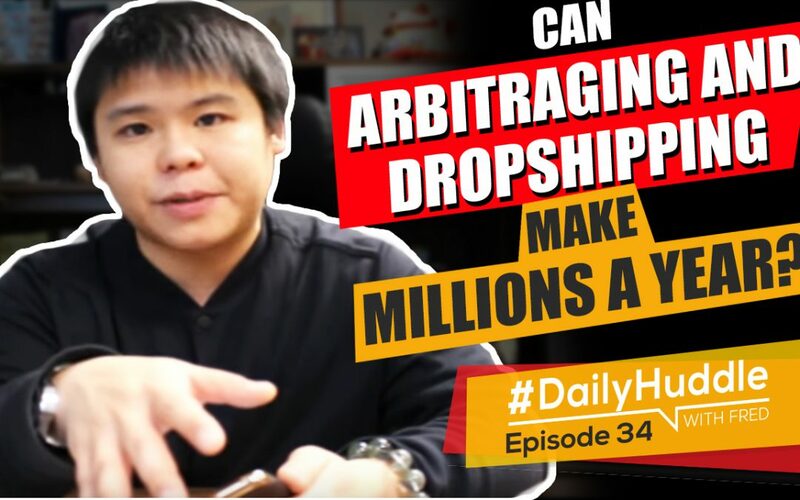 Can you actually drop ship and use arbitrage to make millions? The answer is YES. For me majority of my products that are selling absolutely well and are doing millions a year. I don’t touch the product. My vendor does it all for me. I simply just sell it and it just gives me a peace of mind. Also, I can tell you it is somewhat a stepping stone though. I want to explain to you why at the end of the day you can make more millions and maybe eventually have a large acquisition of your ecommerce business then you want to treat it as a stepping stone at the same time. Here’s why; number one, when you start building a site and when you start selling a particular product and it’s doing well. What you can do is tell your vendors, “You know what, I want to sign exclusively and I’m going to sell all the inventory that you have.” That way the person doesn’t have to sell to anyone else and he or she will just sell it to you. That’s what I do a lot. I find a product that sells really well and I basically get them to give me exclusivity so I am the only person who can actually sell online. Guess what? No competition. In order for you to do that you have to basically kick start somewhere right away. You have to build your portfolio, your traffic, your customer database so you have assets and you have big cards in your hands to play this game. Obviously, that’s what you have to do. If you’re like, “You know what I just want to make like a good $2 to $3 million a year” then doing drop shipping is fine and doing inventory arbitrage is fine too. But if you want to hit greater milestones, you need to treat it as a stepping stone. So, what do you have to do? Number one, you can private label the products and create your own brand lines. That is very important if you want to have a big acquisition. Number two, with your portfolio and with your ability to show that you can produce thousands of sales a day on a particular product. Guess what? When you go and find other suppliers from other sources outside Aliexpress maybe someone who is really great in research and development that has a great product but doesn’t know how to market it since now you have a portfolio you can go to them and say, “You know what, let me sell your product. You take care of all the shipping, packaging and the fulfillment. I will just sell it but I want exclusivity. I can do thousands of orders a day for your product but I need to be the person who can only sell your product.” Now, you are differentiating your store with other people’s store. You are selling products that other people cannot sell. When you start building your portfolio up and have more products in your store which are unique and potentially you have products that you have private labeled, guess what? When an investor comes in or when a person who wants to buy a business looks at you and says, “Wow, this business is not just all about drop shipping. This business built a brand; they have a relationship, exclusivity deals, and contracts.” Guess what, you can easily 5 to 10X your sell out by doing so. Again, it really depends on where you want to go with your ecommerce business but you still have to start somewhere. Identify the product that’s going to sell well, sell the heck out of it, build a relationship with the vendor, scale it up, sign an exclusivity and start using your website portfolio to attract other vendors who are basically out of the norm that makes your store unique, private label products and basically a way you go on branding and building your store. In Zero Up lite and even in my training, I tell people, “You have to brand your stuff.” You have to get a logo. You have to look clean and great so that people from outside see and say, “Wow, this is a legitimate store. This is a great store and I will love to be part of it.” You can attract investors by doing so. I’m just letting you know and sharing that with you guys. Again at the end of the day, I know a lot of people and even some of my students are making millions just doing arbitraging inventory and not moving the next step. At the same time I still have just really handful because it is a very different animal that they are starting to private label products and that’s where like big acquisition can actually come in place. [0:24:43] Question 5: If I start with a new page in fb, what is the best marketing objective? If I start with a new page in fb, what is the best marketing objective? Always, website conversion. You do not have to basically use a Facebook page to attract followers. Your ultimate goal when you invest your time and money into your business which is now Facebook page is really an ad set, you have to focus on website conversion. You have to translate ads invested into profit made and that’s very important. It is always the golden rule. It is always something that you absolutely have to follow and to really look at. It doesn’t matter if you have hundreds or 200,000 followers on your Facebook page. If they cannot translate to a sale then they are worthless to you. I’m just being very blunt, honest and upfront with you guys. I know that I got a lot of messages saying that you guys miss me, so put in the word “Miss Fred” in the comment box on YouTube and on Facebook to see if you guys actually missed me or you guys are like, “Yeah this guy is annoying as F!” Alright, I have a lot of people saying Miss Fred right now. Sweet! Now to the most important part, we’re going to announce our next kick start 500 winner where I’m going to invest $500 into your business. You have to fill up a form for the application and if you have not done that yet, simply go to www.fredlam.com/500, that’s where you can have it. So our next kick start 500 winner for this week is Efezino Acaputo. He is our winner for our kick start 500 grant and here’s his story and why I actually chose him at the end of the day. I am from Nigeria in West Africa. I venture into ecommerce in December 2016 after seeing Fred Lam starting from zero e-book on Facebook. I was excited and I devoured the book twice. I downloaded all the Starting from Zero ten-part video training series and I was able to build my first ecommerce store. I will start following Fred Lam on YouTube. I was usually part of that #askfredlamshow most Tuesdays even though the time was not usually bearable to me but I have every single video from the show and all of his other videos too. I did all the training but the biggest challenges I have are funds for ads buying. I’ve truly learned Facebook ads from Fred Lam but my challenge are funds to my campaign. He goes on and talks about what he has been doing, his website and all those other stuff. I know that at the end of the day, having you invest money into your ads get you uncomfortable At the end of the day, like I said you have to be uncomfortable to get a breakthrough. However I’m going to help you out Efezinoso at the end of the day congratulations on wining the kick start $500. I’m going to get someone from my team to reach out to you and honor that to you. Maria, you do not want to actually ad in the $, it’s www.fredlam.com/500/. That’s what the URL is in order for you to apply for our kick start $500 grant. So that being said, that is it for today’s daily huddle. I’m going to be on tomorrow and Friday. Listen; if you have a question or you are stuck in your business and you want my advice or you want me to share my answer and knowledge with you simply go to www.fredlam.com/ask. Also, please make sure you like my Facebook page, subscribe to my YouTube channel and if you subscribed to my YouTube make sure after you have subscribed, click on the bell icon on the right side of the subscribe button so each time I come on live you’ll be notified on what is happening. Again, there are two more episodes before we hit 2018 and I would have to tell you in 2018 , prepare for an amazing ride with me. You are going to be blown away of what I’m going to do with you in 2018. And it doesn’t require to spend a single penny. What I’m trying to do is to help you guys inspire you guys and to actually help us send many individuals as possible to become an entrepreneur. Make sure you tag a friend, do something, tell your friend about me, get them to like my Facebook page. I don’t buy my followers because at the end of the day those again, we buy them and they are not even really following me. It’s just like buying my likes and it doesn’t make sense . I want genuine followers. So seriously if you have a friend who wants to get into the road of entrepreneurship, make sure you tell them about me, get them follow my stuff, watch my daily huddle and everything. That’s it for today guys; I look forward on seeing you tomorrow. Tomorrow is Thursday; I have to spend time with my members so it will be later tomorrow that I’ll come on live. That’s it for today; I’ll see you guys tomorrow.